Now is the perfect time to commission a custom portrait. Request it in time for the next holiday or special occasion, and your loved ones will be deeply touched by such a personal and thoughtful gift. Commissioning a custom portrait is easier and more affordable than you probably thought. Just send us photographs of your pet and Todd will create a custom portrait. And don't worry about the quality of your photos, Todd can work from almost any image! You can send digital images via email or printed photographs by mail (these will be returned with your portrait). You can even send multiple photos as reference for one composite portrait. Don't hesitate to request a custom background with a particular environment or color(s). Todd specializes in creating such custom elements. Portrait artist Todd Belcher is known for his colorful, stylistic interpretations and his ability to create a single, composite portrait from multiple photographs. He creates every custom portrait by hand, utilizing his artistic gift to convey the unique likeness of each of his subjects. * You can return to this page at any time by clicking the Promotion page in the menu. 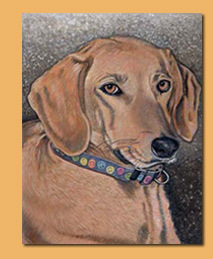 Custom portraits make a distinctively wonderful gift, especially for the pet lover. A custom painted pet portrait can also be a treasured way to immortalize a lost pet, honoring their unconditional love through art. 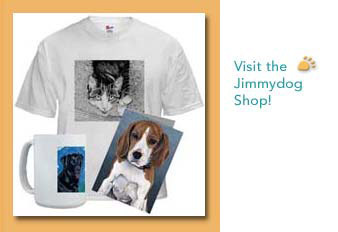 Visit the Jimmydog Shop to purchase gifts featuring several popular dog breeds including golden retrievers, labs, collies and beagles. 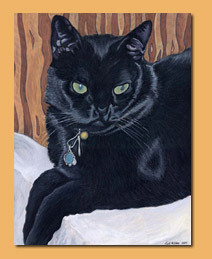 Pet portrait gifts available are custom cards, t-shirts, mugs and more. If you wish to give a custom portrait to multiple friends and loved ones, fine art prints are also available. Each fine art print captures the rich color and detail of the original portrait and is hand-signed by the artist. Want to give a portrait to a friend or family member, but don't have a photo of the pet in mind? Consider giving a pet portrait gift certificate instead! 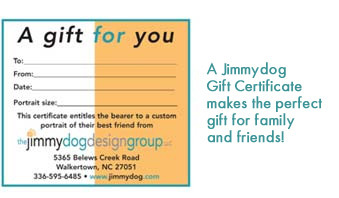 Jimmydog gift certificates are available in any denomination and can be used at any time toward a custom portrait. To order a gift certificate, simply select the value you wish to purchase and contact us by phone or email. Your gift certificate will be personalized and sent to you or directly to the recipient. We can even send to the recipient by email if you've waited too late and need a last-minute gift! Detailed information including sizes, prices and how to send photographs, is provided on our Commission a Portrait* page. *Return to this page at any time by clicking the Promotion page in the menu. For questions or commissions, contact Todd directly using our contact form or by phone at 336-201-7475.